So That’s What the Burner on the Gas Grill is For! It’s summer and I can’t even think about heating up the oven or making a mess on the stove. But I wanted to try to make homemade potato chips in a healthy oil, but deep fat-frying is not something I ever do. Eureka! So that’s why they put a gas burner on the gas grill! Make the chips and serve them hot while dinner is cooking on the grill. 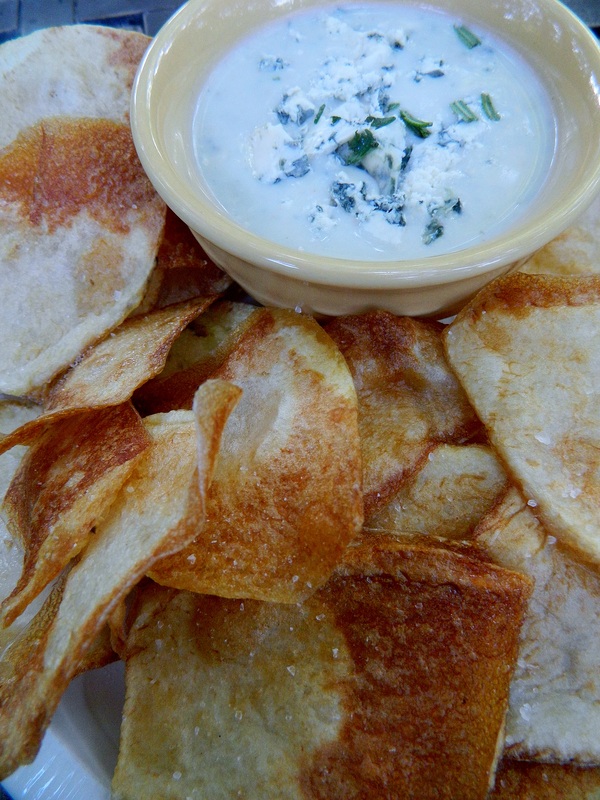 Hot chips, a savory blue cheese dip and cold beer – what a hit (and dinner hadn’t even started yet!). Season your chips with anything like Old Bay, pepper, BBQ dry rub, etc. I used sea salt because of the blue cheese dip. You can also make any kind of dip or use a fresh produce-section blue cheese dressing. Even basic Heinz Ketchup makes a great dip with chips seasoned with freshly-ground black pepper. Heat the oil in a large saucepan to very hot, about 375 degrees. A good test is to splash a few drops of water in the oil and if it sizzles and spurts, it’s ready to go. Drain on paper towels, season with salt or desired seasonings and serve immediately. Saute shallots in butter until soft, about five minutes. Add flour and whisk for a minute. Whisk in one cup of milk until thick, add extra milk for desired consistency. Serve warm or chilled. Top with fresh herbs and more blue cheese if you wish. You can make this first on that same outdoor burner before you start the chips. Or make the day ahead. Me and the girls were putting on a celebration dinner for a friend. 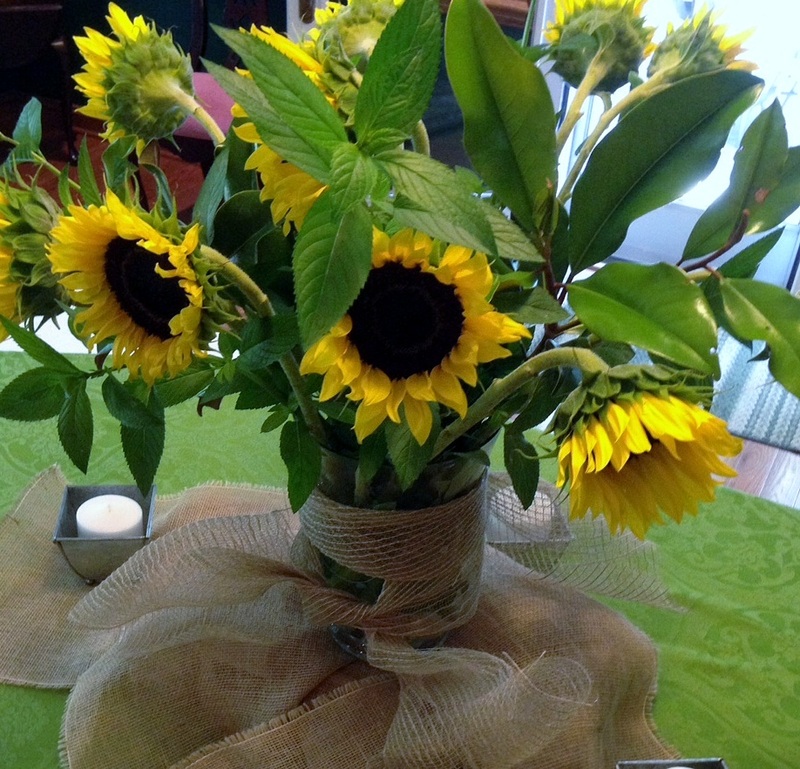 I had eight sunflowers I hastily picked up at the grocery store. I had no idea what I would do with them beyond putting them in a vase. I grabbed some scissors and went foraging through a strange yard and found fresh mint growing wildly in long stalks. (The owner of the home said, “I had no idea I had mint in my yard!”) I found a Magnolia tree and cut some grand, green shiny leaves. Wrap a little burlap around the whole spontaneous display and we had a summer centerpiece. Like I said, bloom where you’re planted. Have a wonderful summer day! Thank you for reading.